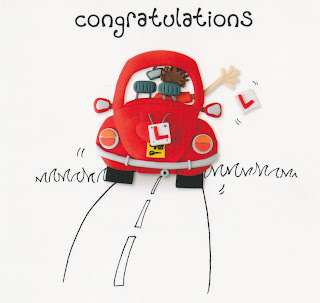 Very pleased to report that I passed my UK driving test today, nearly 21 years to the day when I got my California license. Hooray! The parking brake as 'hand brake' for stopping at red lights. WTF? Not giving pedestrians or cyclists the right of way. I really, really hate this, especially since I'm usually the target pedestrian or cyclist. Using mirrors excessively. Mirrors are a great asset to any driver, but the way they teach you to drive over here has you looking behind more than in front. Reversing around corners. OMG this is the stupidest maneuver and I have no intention of ever using it again. Driving with both hands on the wheel all the time, to the extent that shifting is nearly impossible. Also, I know it isn't recommended practice, but turning the wheel with hands at 10 and 2 pushing and pulling is really more trouble than it's worth. And it makes you not only look like a granny, but drive like one, too. Not gonna do it anymore. Of course, all this is somewhat academic. We don't have a car so I have very little use for a license. I'm happy on my feet/bicycle/the Tube, but it is nice to have some options. Thanks, S, for the card!